Flipkart is now offering Flight ticket booking using Flipkart app powered by MakeMyTrip. As a part of inaugration offer get Rs. 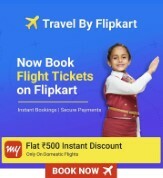 500 off on all domestic flight booking done via the flipkart travel platform powered by MakeMyTrip For limited time get. You can avail flat Rs. 500 off on flight booked via all bank debit or credit card or netbanking on the flipkart travel platform. Offer valid from 22nd may to 27th June.You can follow the below steps to buy this product at their deal price.Keep Visiting dealsheaven.in for more Best offers ,hot online deals, promo code, free deals online,free samples, coupons and discount . Rs. 500 off between Rs. 500 to Rs. 10000. How to get Flights Rs. 500 off on Rs. 500 @ Flipkart App? Pay the amount by Debit card or Credit cards or Net Banking.